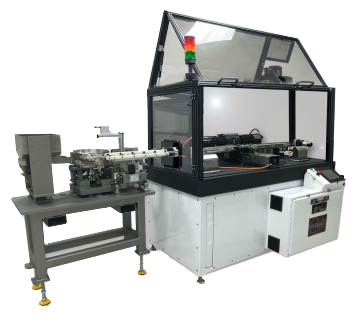 Glebar’s DD-7 double disc machine, configured with a bowl feeder, loaded the blanks into a vertical carriage plate faster than 1 part per second. Two opposing, controlled grinding wheel slides with 0.1 micron position accuracy maintained the gap between the parts, insuring length control. A post grinding contact gauge insured that better than 0.00015” perpendicularity and length accuracy was maintained at a high rate of less than 1 second per part. Changeover to larger diameter parts was a simple operation of exchanging the carrier plate using 4 bolts and adjusting the gap on the grinding wheel slides. Additionally, the move from a batch process to a continuous, unattended process increased productivity and throughput in the cell dramatically.